Creative pallet ideas are sure to come to your mind if you think a little bit deeper! 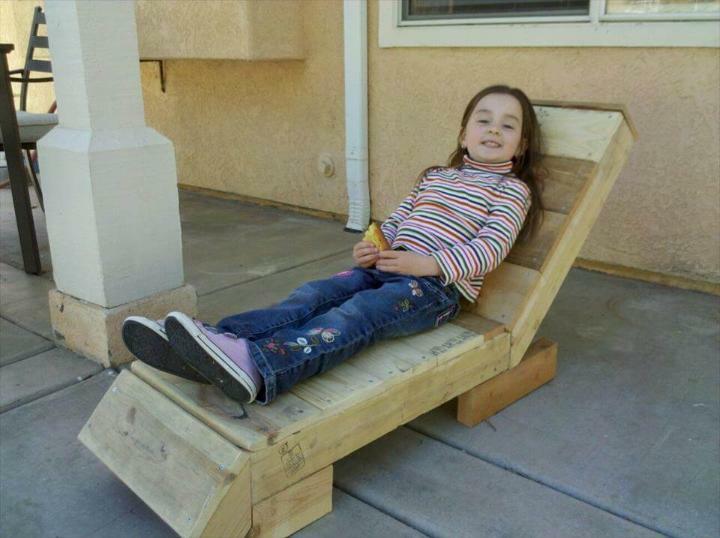 Get this insanely clever layout of DIY pallet lounger for kids, perfect style of chair to make your kids addicted to it! Design allows the user to unfold his legs comfortably white being in half laying down position on this chair! The chair is also much friendly to have fun at poolside! It has been made a little bit off the ground by using 4 thicker wooden blocks and has been build with 3 pre-fabricated panels assembled in artistry joinery techniques! Latest hardware can provide a bigger help to hold all the parts tightly in place! The design comes with an angled and super comfortable backrest, a little bend down foot-rest and a berth section! Armrests are optional and you can add or remove them to feel free or to maximize the functionality and comfort of the chair! A grey color inspiration has been shown here to get help while creating an interesting and visually attractive look of the chair! Start collecting pallets and build it right now to have fun! Built kids-friendly furniture with pallets! 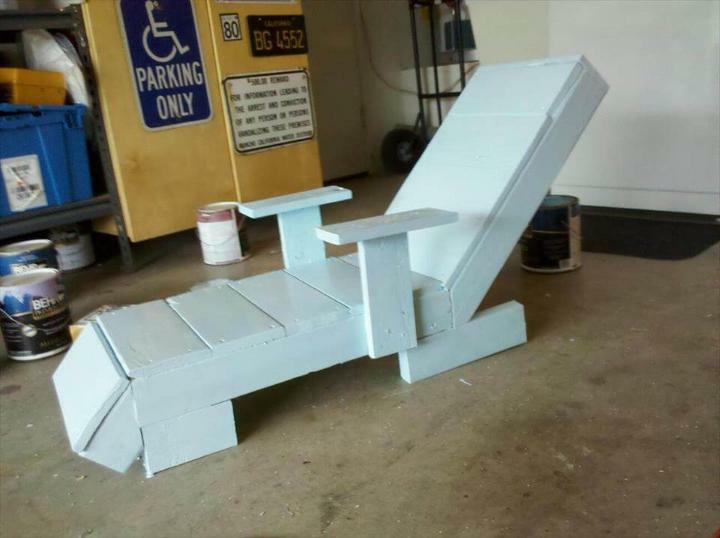 Build this cool poolside chair with pallets, build different panels first like that of berth, back and foot-rest and raise the chair on 4 wooden blocks to reach the comfortable height level! To hold all the part firmly in place, hardware latest hardware should be used! Want a custom look of this chair rather than the antique appeal? Select a friendly paint shade for it or go with stain and sealant to provide more luster and shine to wood grains and also get an enjoyable tone of wood! Add the T-shape armrests or remove them just in case if you feel uncomfortable! Grey has been selected here for a friendlier outdoor look of the chair!